Orchestral Instruments Bingo is a fun way to learn about orchestral instruments. You play just like a normal bingo game, except the items and cards all have a orchestral instruments theme. If you'd like to create your own bingo cards, but with your own customized list of items (about music or any other subject that you like), you can do so easily, by using the Bingo Card Printer software. The software (after you have Registered to get the full version) allows you to add your own items or delete any items that you don't want. Below is a printable set of orchestral instruments bingo cards (click the Print icon in the window to print) along with a call-list. Just print and play! If you want to create your own bingo cards (more cards, different colors, different items, etc.) why not download a copy of Bingo Card Printer? You'll be surprised at just how easy it is. 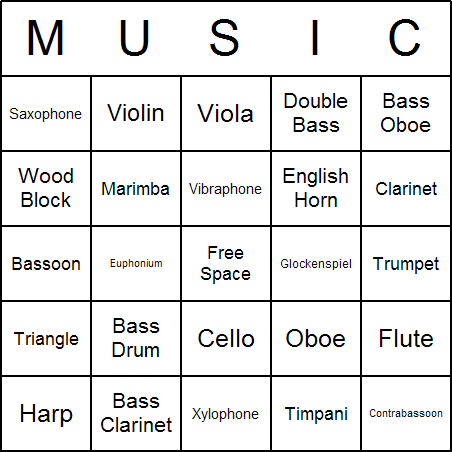 Instructions for producing your own custom orchestral instruments bingo cards are below. Your browser does not support embedded PDF files. Download Bingo Card Printer software, and follow the instructions for installing the program on your computer. Downloading and using the basic features ("Free Trial version") of the program is completely free. If you want to change the colors, click Colors... on the Format menu, change the colors in the dialog box, then click OK. If you want to change the fonts, click Fonts... on the Format menu, change the font selections in the dialog box, then click OK.
Click Print... on the File menu to print. Some features of Bingo Card Printer are only available to Registered users. To register, click Register... on the Options menu and follow the instructions. Only in Registered version of Bingo Card Printer: You can add your own items to the bingo cards by typing them into the field labelled Type your new item here and pressing Enter/Return on your keyboard. Only in Registered version of Bingo Card Printer: If you want to delete items from the bingo cards (either the default items or items that you have added yourself), select them in the list on the left-hand side of the screen, then click Delete Item in the Edit menu. You can print 1, 2 or 4 bingo cards per page: You can control this by altering the setting in the Bingo Cards Per Page dropdown box. Only in Registered version of Bingo Card Printer: You can print more than 8 (up to 9,999) bingo cards at a time. You change the number of cards by editing the Bingo Cards to Print field on the main screen.